The “Repeal and Replace” mantra has become a joke since we have not seen any reasonable, easily understood, proposal for the replacement, let alone any means for transitioning to it from the current mess. Now that we apparently will have a “Republican” president and Congress and repeal is likely, someone best get to work designing the replacement. Is Jonathan Gruber available? It shall be unlawful for private health insurance companies to deny coverage or payment of benefits because of pre-existing conditions. To avoid the problem of individuals waiting until they need medical help before buying insurance, private insurance companies may require a waiting period of up to one hundred and eighty days before coverage kicks in. The waiting period may vary from insurer to insurer in efforts to gain competitive advantage. It shall be unlawful for private health insurance companies to cancel health insurance for any reason other than non-payment of premiums and then sooner than six months after documented received notice of non-payment. It shall be unlawful for private health insurance companies to charge different premiums on any basis other than age and gender of the insured, benefits promised, and deductibles required. It shall be unlawful for private health insurance companies to put annual or lifetime maximums on the benefits from any health insurance policies. It shall be unlawful to limit legality of operation of private health insurance companies or availability of any of their policies to certain states. Individuals and families with annual incomes in any given year below the Poverty Level are fully qualified retroactively for coverage under Medicaid. The cost of the federal benefits in any given year will be fully paid for the following year by an income tax surcharge on individual and family incomes greater than 500% of the poverty level. The percentage of that surcharge will be calculated each year to closely approximate the needed funds and adjusted year by year to exactly do so over the long run. The cost of Medicare and Medicaid services in any given year will be fully paid for the following year by Medicare premiums plus a flat payroll tax calculated each year to closely approximate the needed funds and adjusted year by year to exactly do so over the long run. Employers may or may not provide compensation to employees specifically for purchase of health care insurance, but all policies are owned by individuals, are completely portable, and continue whether employed or not. Other than the above, neither the federal government nor state or local governments may make any rules or regulations about what is to be included in or excluded from health care insurance policies or the costs of such policies or the benefits paid by them. It shall be unlawful for private insurance companies to cover claims only from certain providers and for health care providers to accept benefits only from certain insurance companies. Both insurers and providers serve the citizens rather than each other, and their obligations are to the citizens they serve. Health care providers are free to offer varying levels of care at different prices and to charge more or less than other providers and insurers are free to offer a variety of policies with different coverages at different prices and to charge more or less than other insurers. The above regulations may seem excessively intrusive but are modest compared to the open ended federal options built into the ACA. Such legislation would create true competitive nationwide health care provider and health insurance company scrambles to streamline and reduce the cost of care and to design policies and establish premiums to attract policy holders. The IRS would not be involved. It would make insured care available to all, though individuals would, of course, still have to make choices about whether to buy health care insurance or spend the money on vacations, electronic toys, new cars, booze and cigarettes, but that would be just fine. Of course many would still choose not to buy insurance until and unless they become sick, but that too would be OK. They would risk having to pay their own bills while they go through the process of buying insurance and experience a likely waiting period before full coverage kicks in, and, if they are in the income range to receive federal subsidies, the taxpayers would save some money during the time they take that risk. Such risk takers may go bankrupt, and that would be fine also. If their income gets low enough, they can get Medicaid. Some policies would offer annual checkups, birth control pills and devices, and other routine lower cost items and some would not. And that would be just fine. Some would cover abortions, and some would not, and that would be just fine. Policies would have different deductibles, ranging perhaps from zero to seemingly ridiculous sums like $50,000 for a wealthy person who would just as soon pay his or her own bills except in catastrophic cases. I expect that such a program would be so successful, that it would eventually replace Medicare, putting those of us over 65 in the same program as our younger fellow citizens. Health care spending would no longer add to the federal deficits and debt. And spending on health care in the US would decline as a percent of GDP. And, most importantly, Individual freedom, personal responsibility, and free market competition in the health care industry would be preserved. And the regulators would be very busy making sure all the items above are being obeyed. Finally, design of a smooth transition from the convoluted mess we have to the freedom and simplicity desired will require greater minds than mine. I’m guessing it might require a transition period of three years or so during which the ACA would continue and providers and insurers would design and test the new systems, perhaps in limited markets. And, there is the simple fact that the “Republicans” may find it as difficult to “Repeal and Replace” the ACA as President Obama found it to close Gitmo. Campaign promises are like that. 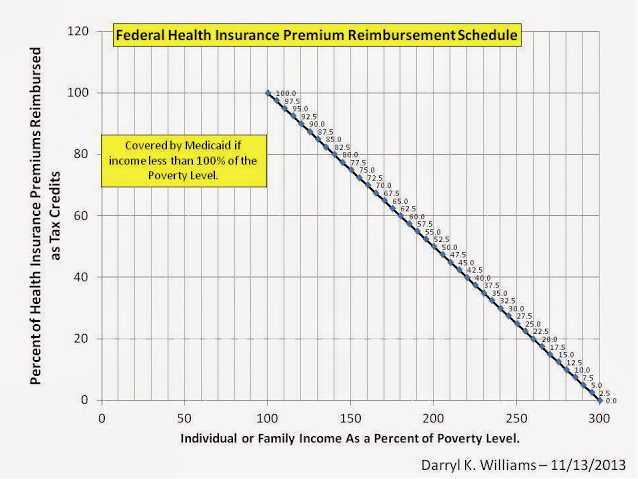 Note: I don’t have enough information to do the math on exactly what would be reasonable for the reimbursement schedule in the chart above and what the impact on tax payers with larger incomes would be. If such a plan as this were put forward, there would be much number crunching going on by policy wonks and the Congressional Budget Office and some reasonable level would be agreed on. I bet it wouldn’t be too much different from what I am proposing. Darryl you have clearly put s great deal of thought in to this. I read over it and I think it’s fabulous. As side from the missing element, that being the rate chart, I’d love for you to respectfully submit it for consideration. Perhaps someone with more of a business mind than I have might find a missing element but it certainly looks more than reasonable to me! Good luck! Good Idea for simply fixing what is broken. A couple of thoughts; I write ACA for people and right now there are many who make less than the $12,000 per year credit threshold that do not qualify for Medicaid, for some reason. I would add that qualifications for Medicaid be simplified and well known by the public. Second, and this may have been what you refer to as the “rate chart,” but there has to be a Usual, Reasonable and Customary (UCR) allowance established for all procedures. This exists now and should be maintained.